Never marry a tennis player. Love means nothing to them. Or so the old joke goes. I’m convinced that there should be a teaching equivalent of this line that goes something like: Never offer an examiner some cake. ‘Some’ can mean absolutely anything to them. This is no joke, though. It is the very nature of these assessment descriptors that the interpretation of words like ‘some’ or ‘evaluative’ or ‘understanding’ is entirely subjective. Daisy Christodoulou has written about this problem with criterion-referencing, citing both Tim Oates and Dylan Wiliam on the issue of the subjective interpretation of descriptors. It seems that the English language is pretty unhelpful when it comes to precision of meaning. So it came as no surprise when I tuned into this week’s #engchatuk to find English teachers discussing the topic of teaching ‘evaluation’, with a broad range of interpretations of what the word meant. The natural conclusion of this is that there were also a wide range of ideas presented on how we should then teach pupils how to evaluate. There were a number of interpretations (and, thus, approaches to teaching) that I don’t think I agree with and some that were close to my own interpretation. What one might do, having identified what these comments are doing, is to teach pupils to make similar comments – we could give them sentence stems, or model the process with a text. But I think that misses out something crucial here and that is: the importance of who is doing the evaluating here. Paul Hollywood was born into a family of bakers – his parents own a bakery, and his grandfather was head baker at the Adelphi Hotel in Liverpool. He started working with his parents at 17 years old and, in his own words, “lost my youth because I had to get up and go to bed early… I never had girlfriends or went clubbing until I was in my mid-20s.” By the time The Great British Bake Off hit our screens for the first time in 2010, he’d had nearly 30 years of professional experience in baking, including holding the position of head baker in such lauded institutions as The Dorchester hotel on Park Lane. But Hollywood is just a beginner compared to Mary Berry, who began her working life demonstrating ovens for the electricity board – she’d do this by turning up to people’s homes and baking them a Victoria sponge. After studying at Le Cordon Bleu school in France at 22, Berry worked for a range of food related bodies (such as the Egg Council and the Flour Advisory Board), before becoming food editor on a number of magazines. Over her 60 year career, she has published more than 75 cookery books. What is crucial to Hollywood and Berry’s ability to evaluate so effectively is the knowledge and experience they bring to the task. They can evaluate precisely and judiciously because they know their way around good baking. The recipes that they are tasting may be new to them, but they have a clear understanding of the processes a baker needs to go through to achieve success across the gamut of baking techniques: they understand immediately whether something has been successful or not, as well as the reasons why it has or hasn’t worked. What is more, they can instantly identify what the baker should have done to improve or rectify. They understand the wider context of any bake – the required effect of the recipe, and the tradition that runs through a particular style of baking. And, in an instant, they apply all of this knowledge and experience to what they are seeing and tasting and… they evaluate the bake. So how do we teach pupils to evaluate in their reading responses? Obviously, we don’t have the time to furnish them with the wealth of knowledge and experience that Hollywood and Berry have accumulated, but building knowledge and experience should be our goal nonetheless. The way to teach evaluation is, first and foremost, to ensure pupils read lots. Build up pupils’ experience of writing and of the traditions of writing – of literary fiction, poetry, non-fiction, drama, etc. By experiencing the effects of writing, when confronted with a new text, we want them to be able to identify when a writer has followed a tradition or subverted it, whether they have been successful in achieving an impact, or how utilising techniques may have highlighted their biases. Secondly, when reading a text, we should spend a lot of time teaching context: what are the historical, social, cultural and biographical contexts that inform a text? When evaluating, pupils should be connecting their analysis to these contexts – can they read the text through the veil of what they know about the writer’s interests or perhaps the contemporary reader’s preoccupations? I’m totally convinced that this is what evaluation is in English: connecting a text to one’s own knowledge and experience of reading. It isn’t a quick approach, like giving sentence stems or modelling the process (we should do this anyway, all the time), but it is quite simple: get kids reading more and think carefully about what they are reading. Read through the traditions of writing – from Greek myths to modern reportage. And read around the texts too – build up a picture of the context: the nourishment that fed the writing. So where analysis might be seen as a student’s understanding of language, evaluation is an expression of their wider knowledge. You want me to end this by saying “it’s the icing on the cake”, don’t you? Well, I won’t. I’m better than that. Only an idiot would end a blog with a half-baked pun. “So, you’re wanting to be a London cabbie, then? Hope you’re prepared to put in all the hard work it takes to do the job? All the study?” asked the slightly gruff, porcine man. “Er, yes. I’ve just got the Blue Book, and I’ve started trying to learn the roads and runs and that…” replied the enthusiastic young man. “We don’t use that…” the gruff man insisted. “If I just learned… The Knowledge,” the young man darted a forceful look at his interlocutor as he mouthed the words, “I could just apply that knowledge to what I needed to do. The Knowledge would ensure that I’d know what routes to take at certain times. The Knowledge would mean that analysis and evaluation and creation would be more-or-less automatic: I’d be able to make quick decisions of analysis and evaluation and change my route using the knowledge I’d have of the runs. I’d be able to create new runs without really thinking too hard. Why do I need to learn these skills in a different place and then try and apply those skills to the place where I actually need to use them? It doesn’t make sense. I understand that creativity and evaluation and analysis are important to a cabbie, but these are things that just spring forth from a sound understanding of The Knowledge. I don’t need to learn creativity as a discrete skill. It’s nonsense.” The young man sunk back into his seat. He pointed to another poster, this time on the adjoining wall. One of the best things about taking cover lessons outside of your subject area is that you often come away having learned something new. In my particular experience, Geography is the lesson I usually come away from loaded with bags of new knowledge, having bugged the kids with questions for the best part of the hour. To put it bluntly, before I started teaching, my knowledge of tribal communities mostly extended to the moment that a hippo took an apricot, a guava and a mango, stuck it with the others and then danced a dainty tango and… well, the rest is history. But thanks to Geography cover lessons, my knowledge of tribal communities is much deeper. I now know that Um Bongo is actually produced in Somerset (they do genuinely drink it in the Congo though). I also recently learned about another tribal community, named the Mundurukú, who live in the Amazon River basin. As far as I am aware, they did not invent any soft drinks, but they are interesting for another reason: they have a number system that only goes up to five. That is to say that they only have words in their language for numbers one to five (which is probably why Brazil did so badly at the last World Cup: if they’d have won, it would have been their sixth trophy – how would they have explained that to these people?) And whilst we may find having only five numbers in your language peculiar, the Mundurukú would probably look at the Pirahã people (a ‘neighbouring’ tribe located some 700 miles away) with a similar curiosity: the Pirahã only have words for numbers ‘1’ and ‘2’. Don’t worry, they’ve got all eventualities covered: for anything greater than two they use the word ‘aibaagi’, which means ‘many’. So basically, everything with these tribes is quantifiable up to a point and then it just becomes vague, ambiguous and equivocal beyond that. To us it seems unworkable to have a system where everything is clear and distinct to begin with, then becomes imprecise and woolly once it reaches a certain level. 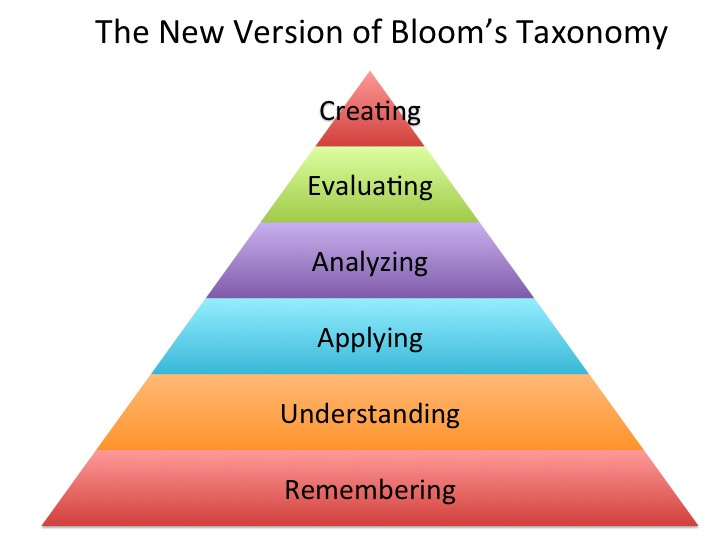 But that is basically how I see taxonomies of higher order thinking, such as Bloom’s. It strikes me that, according to such taxonomies, the higher the order of your thinking, the less likely it is that we can actually define or measure it. Which is problematic if we are encouraged to live by them, as we are in many schools. But maybe it is precisely that same problematic nature of these ‘higher order thinking skills’ that puts them at the top of the hierarchy in the collective consciousness? Because – and here’s the crux of my thoughts on this taxonomy – I don’t actually believe that those soft skills at the top are actually harder than those distinctive ones at the bottom: I think it is often harder to remember than it is to create. I’m of the belief that it can often be more difficult to understand than to evaluate; indeed, it is only once you understand a concept that you are in a position to evaluate using that concept. I’d even argue that, if you have full understanding of a concept or concepts, evaluation of it/them is a very simple process. Just watch how quickly and precisely experts like Mary Berry and Paul Hollywood evaluate the shortcomings of a technical bake – they do this because they have complete understanding. One could even suggest that their understanding came after mastering creating. Yet, it is the slippery nature of these soft ‘higher order’ skills that means we see them as somehow more advanced than the others. I recently went on a course aimed at improving higher order thinking skills. During this course, there was never any discussion of pupils actually knowing things. 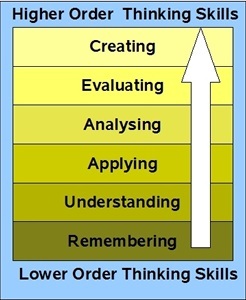 It was all aimed at them being able to do the stuff at the top of the taxonomy – creating, evaluating, analysing. What the course missed was that, by teaching pupils content, by building their knowledge base, by making sure they can remember things, by ensuring they understand concepts, the ‘higher order’ stuff becomes much, much easier for them. With stuff like Bloom’s, we are often deceived into missing this. For me, it seems that the so-called ‘lower order’ skills (such as remembering, understanding) often involve a lot more cognitive processing than the ‘higher order’ skills (creating, evaluating, etc.) Indeed, those ‘higher order’ skills often involve the brain just making short cuts using the hard-earned knowledge – that which was acquired through ‘lower order’ thinking. So, Bloom’s taxonomy? Higher order thinking? If we want pupils to do the things at the top of those ranks, I think we should ignore these hierarchies and, instead, concentrate on teaching content and building pupils’ knowledge. Honestly, I think it is that simple. As simple as do-re-mi, A-B-C, 1-2… um… many? Note: the penultimate paragraph – italicised – was added on 30th September 2014, to clarify the argument made in the post. Learning other languages is beneficial to pupils. Developing a wide English vocabulary is beneficial to pupils. Creating a common language across subjects is beneficial to pupils. The reason I think this represents cognitive dissonance is because the third theory seems to want to reduce the language pupils use in school, whereas the first two seek to increase it. Despite this understanding that increasing the language of our pupils is a good thing, the idea does seem to exist, if not pervade, that we should create or rely on a reduced, common language to use across the various subject domains. Most recently with the removal of National Curriculum levels, I have seen numerous people suggest that the levels and language of SOLO taxonomy could be a suitable replacement. This was notable during last Thursday’s #UKEdChat. This is quite bizarre: one of the complaints about NC levels was that they were vague. I find it odd that some feel that moving to an even more equivocal set of levels and descriptors is the answer. Like Bloom’s taxonomy, SOLO uses descriptors which are open to a wide range of interpretations, even within a single subject area. And this is the other problem with assuming that a common language is helpful to pupils: words have different (usually polysemous, but sometimes homonymous) meanings in different contexts. Surely when words can shift in meaning depending on context, the language is no longer a common one? As each subject area presents a different context, the ‘common language’ gets taken in different directions by its different speakers. It’s analogous to the dialects of England and America and George Bernard Shaw’s observation that the two countries are “separated by a common language”: both England and America use the same words, they just don’t always mean the same thing. So if I said, “I took off my trousers by the bank”, the context in which I said this would certainly change the meaning of the word bank. You’d hope that I was stood by the side of the lake, replete with a bathing suit and not lining up a shot in the final frame of the World Championship at the Crucible. Likewise, if we have to rely on the vocabulary of a school’s common language, we are avoiding the more domain-specific vocabulary that would make meaning more precise. So when I ask my pupils to analyse a text in English, it is a fundamentally different thing to when they are asked to analyse a chemical compound in Chemistry. Just look at this enormous list of applicants of the term analysis across a large number of disciplines. And even within disciplines, there are different meanings to the word. If analysis had one fixed meaning, there would be no need for the numerous collocations (‘aura analysis’, anyone?) in that list. @fkelly @tombennett71 @jonesieboy Using the same words to describe fundamentally different things is not an advantage. I would always argue the case for schools to allow subject areas to establish their own, domain-specific language for practice and assessment. Why assume that our students need a reduced, catch-all vocabulary in order to make sense of their learning across subjects when it is more likely that such a vocabulary will obscure the understanding process. When it comes to world globalisation, we are always reminded of the importance of the plurality of languages and heed warnings to protect them. Are we as defensive of our domain-specific language when it comes to ‘globalising’ schools and blurring the boundaries between subjects? 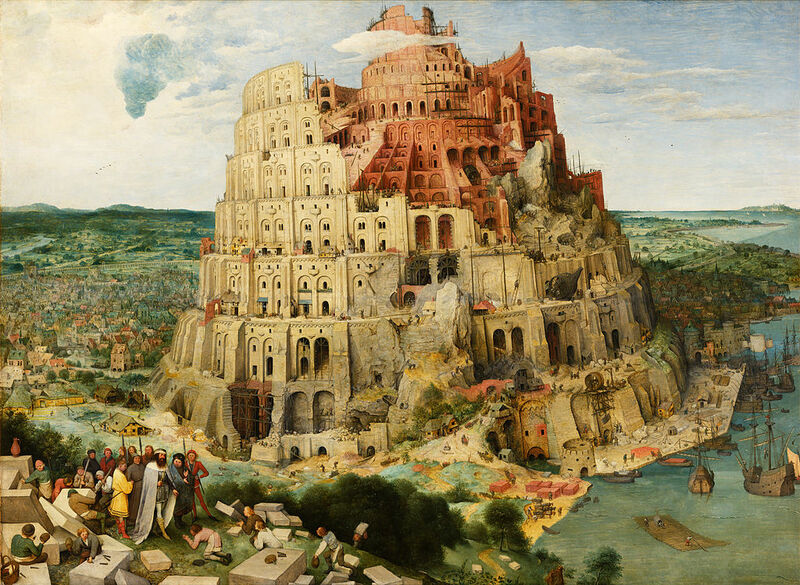 Likewise, if we are going to combine many subjects with very different vocabularies, we shouldn’t impose any single language across all of them.